Cassava Fufu is regarded as the most traditional Nigerian fufu meal. There are powder versions of other Nigerian fufu meals which makes it easy for modern day ajebutters to prepare them but not this one. I fear that this meal is becoming extinct because 21st century babies do not want to prepare it any more. In Igboland, Cassava fufu is mostly eaten with the very traditional Nigerian soups for swallows such as Bitterleaf Soup and Ora Soup but like other Nigerian fufu meals, you can eat it with all other Nigerian soup except pepper soups. Cassava fufu is known by many different names: Akpu (in Igbo), Loi Loi, Santana and Mr White. It is extracted from cassava tubers (yuca). The only ingredients you need to prepare Cassava Fufu meal is the raw cassava fufu and water. My grandma and others from her generation add unripe local banana (unere) which they boil and pound with the cassava fufu. If the raw cassava fufu does not hold together when you try to make the balls, add cassava flour (akpu nkpo) to act as binder. Note: The cooking times depend on the quantity of akpu you are cooking. For this demonstration, I cooked about 1Kg (2.2lbs) of akpu. Set some water to boil. The water should be enough to cover the balls of akpu. Put the raw cassava fufu in a bowl and knead with your hands to mix the particles well. Add some water as you do so, a little at a time. This is to make it bind together when you make the balls. Make sure it is not too soft. When happy, make medium balls of the akpu and set aside. If the akpu is too weak to make balls, add some cassava flour and mix well. This is usually the case if you try to cook Cassava Fufu which you extracted from cassava tubers the same day. When the water boils, add the lining to cover the inside of the pot. Then add the cassava fufu balls. Cover the pot and cook for 5 minutes. When you see cracks on the balls, it means it is ready to be taken off for the first round of pounding. Turn off the heat. Transfer the balls of cassava fufu to a mortar and pound very well to crush all the lumps. If using a stand mixer, put it in the bowl and run it to mix the "dough". When done, the fufu will look white and smooth with no lumps. Mould them again and set aside. This time the moulds should be a bit flatter. Top up the original water and bring to a boil. Add the moulds of fufu and cook for another 5 minutes. We cook fufu twice because at the half-done stage, the lumps are easier to crush. If you try to cook it straight till done, it will be impossible to crush the lumps and the fufu will be too soft. As you cook it the first time, you will notice that the outside becomes too soft while the inside maintains its original texture. If you continue cooking it without mixing both textures (pounding), the whole fufu will assume the outside soft/watery texture. Pound again and it's done. A well done cassava fufu has an off-white colour. If it is almost grey, it means it's overcooked. Wet a flat plate and put a portion of fufu on the plate. Make a fist with your hand and make a depression at the centre of the mound of fufu. Make the mound of fufu smooth by moving the edges to the centre of the mound till the edges have a circular shape. Turn the now circular mound of fufu upside down and place it on a dry clean plate. 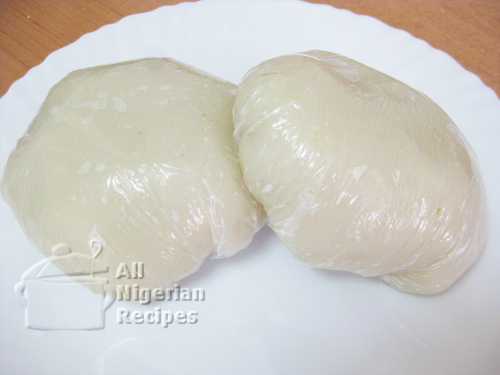 You can also simply wrap portions of the Cassava fufu in thin plastic film as shown in the image above. Again, watch the video to see how I did it. Serve with any Nigerian Soup except pepper soups. Bitterleaf Soup and Ora (Oha) Soup are my favourite soups for cassava fufu.